I’m just back from Cinque Terre—five hillside towns on Italy’s Western seacoast where you feel like you’re vacationing in the 17th century but still enjoy modern wonders such as trains and cameras. Virtually unknown to US tourists twenty years ago, it is now a destination sensation complete with its own Rick Steves, Rough Guide and Lonely Planet travel guides. Tourists from all over the world—including many Asians, especially Chinese—clamber up its steep mountain trails and the equally steep steps that double as streets in these former fishing villages. Oh no! That’s the road to ruination, as the authenticity and tranquility of a newfound place is trampled under the weight of countless tourists’ Nike and Timberland hiking boots. That’s not how the story goes in Cinque Terre. The reason why can be explained in terms of the commons, a set of principles and practices governing ownership which like Cinque Terre is now being rediscovered by the wider world. The commons, in short, means what we all share together—a surprisingly broad category that includes everything from wilderness preserves to the Internet. The word is cropping up more and more in conversations about social equity and sustainability. For a commons of any kind to flourish, it must be managed in a way that ensures everyone can use it without using it up. Otherwise, it’s ruined for future generations, just like a distinctive travel destination overrun with fast food joints and parking lots. The aims and ideals of geotourism fit very snugly with the concept of the commons. Visiting Cinque Terre in late April, the starting line of the tourist season, we were overjoyed to spend a week in a place where pre-Industrial towns, hillside vineyards, olive groves, forests, waterfronts and historic sites are vigilantly cared for. Cars are kept out of the town centers, which are conveniently linked by hiking trails, trains and boats. There are very few chain stores either, creating opportunities for locally run inns, shops and restaurants. My wife Julie and I attribute the sheer, giddy pleasure we experienced in Cinque Terre to the strong sense of the commons all around us. We hiked from town to town on paths that were public rights-of-way trod over by villagers for centuries. We whiled away happy hours strolling and dining in narrow Medieval streets and piazzas—wonderful public spaces open to all. We voraciously soaked up the region’s scenery, cuisine, history, architectural traditions, agricultural customs and easy-going way of life without diminishing their availability for anyone else. No tragedy of the commons here. I sense a lot of overlap in my own work with the commons (as editor of the Commons magazine at www.onthecommons.org and author of All That We Share: A Field Guide to the Commons.) and as a travel writer and community consultant dedicated to geotourism. The spirit of the commons and geotourism are both valuable in boosting grassroots efforts around the world to discover ways of making sure that the places we treasure are not irreversibly spoiled. In many cases these two particular words are not spoken, and may not even be familiar to the activists pursuing these strategies, but the intuitive common sense of both philosophies is nonetheless useful in making a difference for a neighborhood, town or region. 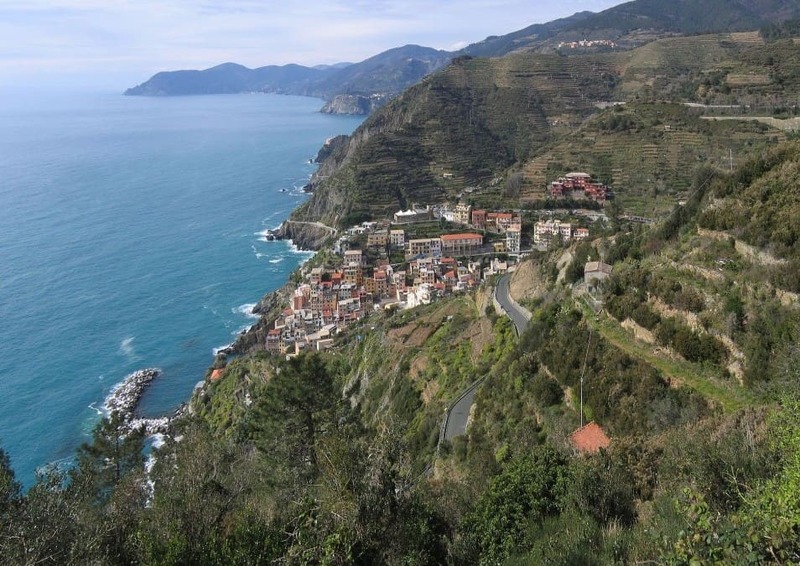 Indeed, Cinque Terre has been able to become a popular destination without sacrificing the qualities that make it appealing because of successful management strategies that draw deeply from the same well as the commons and geotourism. The mountain landscape and the surrounding waters of the Ligurian Sea are national parks, meaning they belong to the Italian people. The area’s natural, historical and cultural qualities qualify it as a UNESCO World Heritage Site, meaning that that all of humanity has a stake in its preservation. But Cinque Terre will need more of this kind of thinking if it is to remain a success story. The growing presence of so many tourists has inevitable side effects. That’s why sustainability consultant Ed McMahon advocates that the number of visitors be capped each year, as is done in places as far-flung as Spain’s Alhambra castle and the Boundary Waters in Minnesota’s north woods. Hikers must already pay a fee to hike Cinque Terre’s breathtaking coastal trails to prevent them from being overrun. But when Julie and I were there, three of the four main trails were closed due to damage from mudslides, caused by heavier-than-usual rains made worse by the fact that stone terraces overlooking the trails have not been taken care of. The bounty of jobs in the tourism economy means that many young people abandoned the hard physical work of tending the vineyards. Unable to walk along the coast, Julie and I hiked from town to town over the more strenuous mountain trails, which afforded tremendous views of the stunningly blue sea from olive groves and vineyards perched on the mountains. And we were very happy to notice that many of the terraces had been newly restored—a shining example of geotourism and the commons in action. Travel writer, speaker, consultant, editor Commons magazine, Senior Fellow Project for Public Spaces, former Editor of Utne Reader and former contributing editor National Geographic Traveler. This entry was posted in Geotourism, Resources, Stewardship and tagged cinque terra, commons, italy, stewardship, tourism management, Walljasper by Jay Walljasper. Bookmark the permalink.